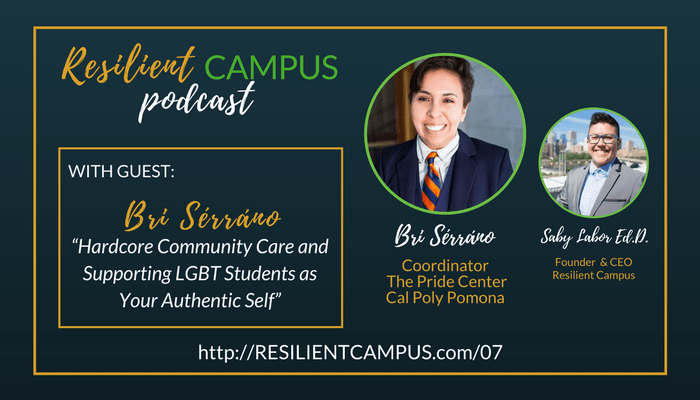 Bri shares some of their first generation and queer college student experience, and provides insight on how they were able to set themself on a rising professional trajectory in an environment with limited resource for LGBT student services. Bri explores the tough questions, like navigating privilege and working towards equity within systems that perpetuate oppression. Ultimately, Bri covers the big, complex and rewarding challenges of supporting students, seeking support from leadership, and cultivating networks of support amongst peers; and concludes that collaboration and deep community care is the true source of their success and joy. Bri is currently a Ph.D. student in the Higher Education Leadership program at Colorado State University and their research interest is on the resiliency among transgender undocumented students of color. They serve on the Executive Board of the Consortium of Higher Education: LGBT Resource Professionals as the People of Color Co-Chair and the NASPA Gender and Sexuality and the Latinx/a/o Knowledge Community as the Latinx Inclusion Co-Chair. Bri has two academic chapters being published in early 2018 and consistently presents regionally and nationally on LGBTQ Latinx and trans identities.